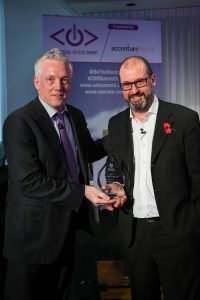 “Digital services and public services are actually becoming inseparable,” said Mike Bracken, the first U.K. Chief Digital Officer of the Year, at the inaugural U.K. Chief Digital Officer Summit in London, England, on October 29, 2014, presented by Accenture Digital. Bracken has been at the center of an all-out effort to digitize government services, thus making them both easier to use and cheaper for the taxpayer. 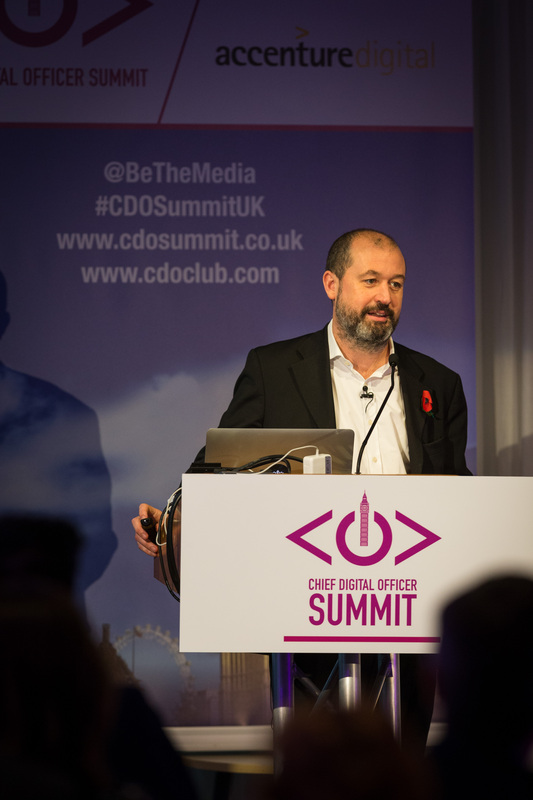 “We exist to create services so good that people prefer to use them,” Bracken said of GDS. The key to his success? Focusing entirely on user needs. 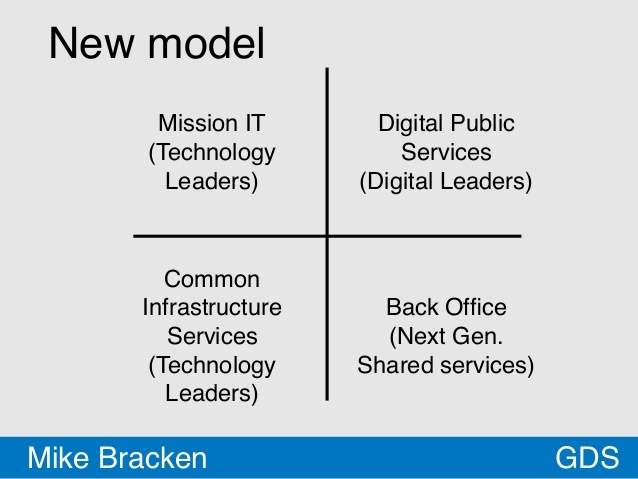 “Unlike previous government regimes, we’ve concentrated zealously, almost evangelically, on users,” Bracken said. A great example of this is the U.K. government’s new website and Internet portal, gov.uk. Launched in October 2012, gov.uk replaced two central government websites and eliminated thousands of pages no one ever visited. “We’ve taken the domain that government has staked down from several thousand websites from when I started to less than 300 now,” Bracken said. 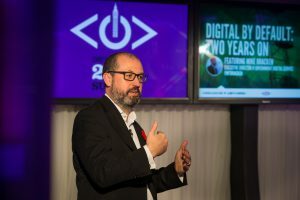 Click below to watch the video of Mike Bracken’s keynote at the U.K. Chief Digital Officer Summit 2014. The first clear advantage is simplicity for the user. For example, when GDS found that most people looking up bank holidays only want to know the date of the next one coming up, they placed that information on the top of the page, rather than simply post a list of dates. “Cost per transaction has gone down 10 percent in real terms in two years, digital take-up in government has gone up 9 percent in just over a year,” he boasted. Computerweekly.com reported that “online public service is 20 times cheaper than a phone transaction, 30 times cheaper than by post and 50 times cheaper than face-to-face.” The government may come to save an estimated 1.7 billion pounds by 2015, it reported. The reorganization took place across the board, including within the government institutions themselves. 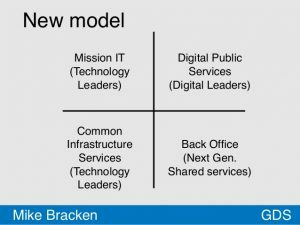 The organizational structure for the technology governance model was so complex that Bracken admitted he himself did not completely understand it. 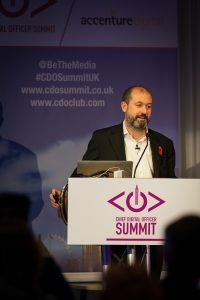 The key to implementing such a model is dividing responsibility among four CDOs or CTOs (Chief Technical Officers), rather than forcing all these roles onto one CIO (Chief Information Officer). One CIO “who would deliver everything from network infrastructure…to procurement service is just not going to work,” warned Bracken. “It’s essential to just aggregate the powers. “We brought in a bunch of chief digital officers and chief technology officers who have separate but related roles. The dynamic between those two individuals in our organizations is probably the most important relationship we have in our large departments,” Bracken said. Large, complex contracts for multiple services also had to go away. “Now we’ve got tools that work…. These shifts in technology provision have left room for CDOs across government to make real progress,” Bracken noted. “Because, crucially, we shouldn’t be bringing people into government who should be focusing on the user” and then having them fix the IT problems. Other real-world examples of how GDS is helping the public is the Last Power of Attorney application. “At a very difficult time of life, for obvious reasons, the last thing you want to be dealing with is all the forms,” Bracken said. 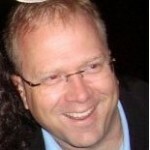 “We took 80 percent of the paper out and made it a digital service. “You can go online and find out how many points you’ve got on your [driver’s] license,” Bracken said, giving another example. The information can also be shared with insurance companies, which had a quantitative result in real life: “Cost of motoring is actually going lower—that’s a direct result of the digital changes that we’ve brought in. The next Chief Digital Officer Summit will be held in New York City on April 29, 2015. 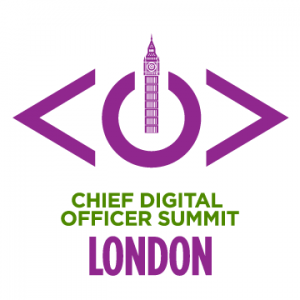 The Chief Digital Officer Summit U.K. will return to London in October 2015.